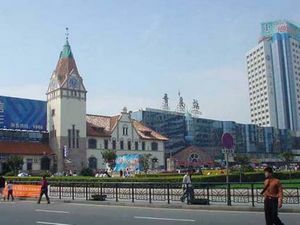 Qingdao Railway Station was built in 1899. Every day there are hundreds of trains heading to cities like Jinan (the capital city of Shandong Province), Beijing, Shanghai, Guangzhou, Taishan, Heze, Yantai, Wuchang, Nanchang, Xuzhou, Zhengzhou, Xi’an, Lanzhou, Xining, Chengdu, Taiyuan, Dandong, Tonghua. Most trains stop over in Jinan. Qingdao-Jinan: There are several bullet trains running between Qingdao and Jinan every day, such as D6024, D6018, D6016, D6014, D6006, D6004 and D6002. A single trip takes about two and a half hours. Qingdao-Beijing: The train T26 takes 10 hours from Qingdao to Beijing; besides, there are bullet trains D60, D58, D56, D54, and D52, which take 6 hours to reach Beijing. Qingdao-Shanghai: Two bullet trains D78 and D75 connect Qingdao with Shanghai, with an 11-hour train ride. Transportation: Passengers can take public bus No. 2, 5, 8, 26, 218, 220, 223, 301, 303, 304, 305, 307, 311, 312, 316, 320, 321, 501 and 801 to the railway station.